"Homecoming". 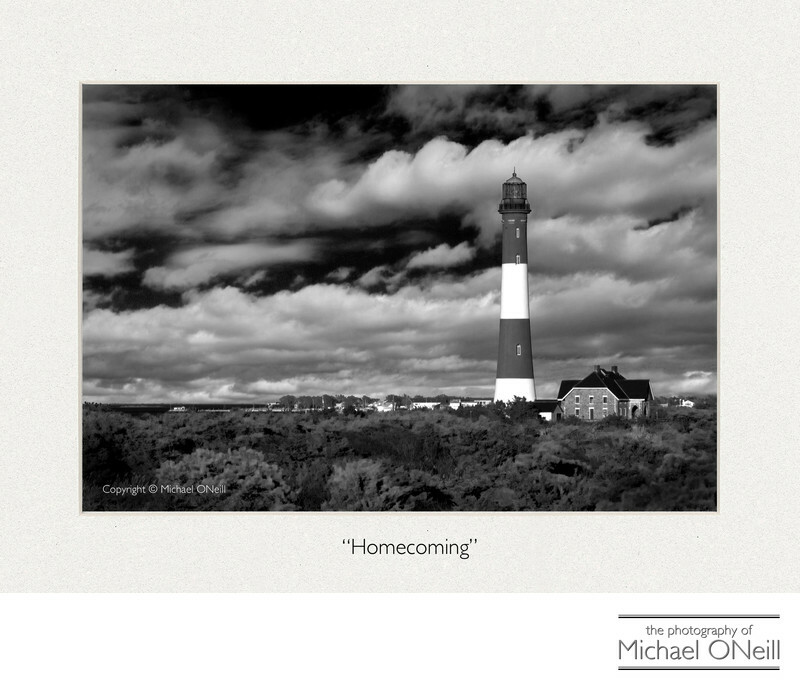 This collectible fine art image is of the lighthouse on Fire Island, New York. This 180 foot tall beacon began operation in 1858, replacing the 74 foot tall tower that existed on the site since 1826. The lighthouse was originally erected on the shore of The Fire Island Inlet which connects the Atlantic Ocean to the sheltered waters of The Great South Bay. Since it’s construction Fire Island has extended itself through the accumulation of sand and now stands nearly five miles east of the inlet! I am often asked if this picture was taken with infrared technology, either digital or film-based. The answer is no, but it was taken using a deep red filter which helped turn the rich blues of the sky to near black. The image was captured with a tripod-mounted Nikon digital single lens reflex camera (DSLR) fitted with a 70-200mm f2.8 zoom lens. "Homecoming" is offered for acquisition artist direct right here on this web site. It is also available through the various fine art photography galleries that represent my body of work. Quite a few copies of this edition have been purchased by collectors...most local Long Island residents but a couple from distant locations in the United States. My works have garnered much critical acclaim through professional photography competitions locally and internationally. My works on the east end of Long Island, from The Hamptons to Montauk Point, have sold at a fast pace to astute collectors in that area. If you are interested in acquiring one of my collectible fine art photography editions "Homecoming" may be the perfect choice to start, or add to, your collection.